We are a group of researchers from the ECE department at National University of Singapore and focusing on elevating the living standard of the energy-poor island of Sumba island by leveraging on the electrification potential and supporting community empowerment. The utility-based electrification model has provision for collecting data at the unit as well as utility-grid level via economic metering-systems, which would enable data analysis to model the time-based energy needs of the community and thus plan energy dispatch as well as pricing in an adaptable manner. 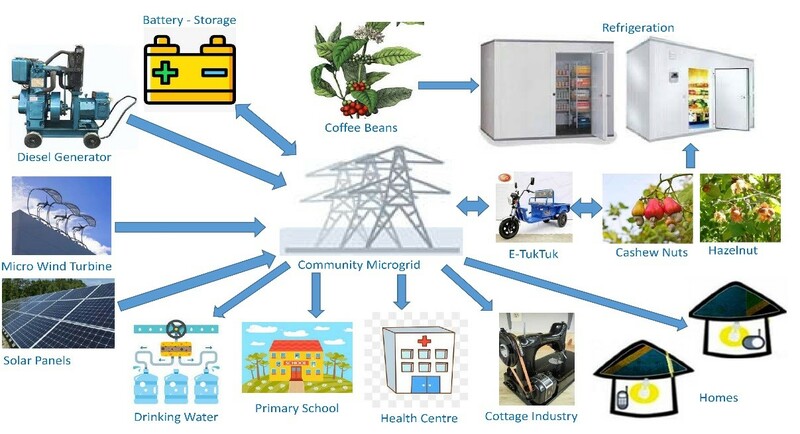 The impact of the community based electrification model provides the inhabitants access to services such as refrigeration, transportation, mechanisation of cottage-industry, etc. This will provide an additional community income of 5000-13000 USD per month (estimated for a community consisting of 50 homes). The proposal includes services such as provision for lighting in community schools, RO drinking-water, and energy needs of basic rural health-center (medicine refrigeration, life-saving equipment, etc). Though the solution tries to maximize the utilisation of renewable energy sources, there is provision for diesel gen-sets so that critical services such as healthcare, drinking-water and communication can be uninterrupted even during adverse conditions like natural calamity which adds to the resiliency of the system. The business model is designed such that the local economy expands with the generation of employment and entrepreneurship opportunities. Thus the aim is to follow a model that is not only reliable and scalable, but also sustainable. Technically, the issue of resiliency is addressed to keep critical services agnostic to the renewable sources’ disturbances. Refrigeration has also enabled farmers to strategize their selling time so that they can maximize their profit based on the market scenario. Moreover, the business model has focuses on community empowerment and economy strengthening via indigenous employment generation which is dedicated to strengthen the local economy. To run the POWER@NUS system continuously for two weeks and test run before evaluation.